This section provides useful content for the public, including information on how to file a complaint with the College. It provides direct access to the College's online physician directory, which extracts contact information, office locations and other relevant details about a physician from the public register in real time. This video outlines the College's expectations of physicians when conducting physical exams on patients. A helpful resource outlining what patients can expect when visiting a walk-in clinic in BC. 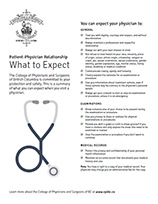 A helpful checklist outlining what patients can expect when visiting a BC physician. 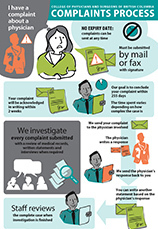 An infographic to help patients better understand and navigate through the process for filing a complaint against a BC physician.